Letting and estate agents are a growing market for the installation of CCTV, according to Darren Roe, operations director at Ecl-ips. He said the company had installed five systems within the lettings and estates sector in only a few months. Weston-super-Mare’s Spaces and Places is one such client who recently installed CCTV following a burglary. 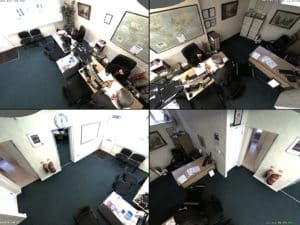 “We had never really considered CCTV before but we had a burglary recently where a thief got away with a substantial sum of money after bypassing our alarm system, and it made us re-evaluate our security,” said marketing manager, Mrs Box. Mrs Box needed a CCTV solution that would be very discreet, with little backroom equipment or maintenance. “We also wanted a system we could view remotely, either from the main office or at night from home to check on the premises if an alarm was triggered,” she said. Ecl-ips recommended and installed a Mobotix Q22 IP camera. Darren Roe said: “The model is particularly suited to small high street locations like letting agents as a single camera can monitor an entire main area with its 360 degree view. The Mobotix system also offers two way audio, audio recording and playback of pre-recorded messages or warnings of an event. Mrs Box said: “I am not a technical person but the new system is incredibly simple to use. If I hear raised voices in the outer office, I can just click on an icon on my desktop PC and check to see that everything is OK and if somebody is getting abusive, we can point out that we have a CCTV system and that usually acts as a deterrent and calms the situation down. Mike Lewis, Mobotix UK and Eire country manager, said: “Letting agencies and smaller retail outlets don’t tend to have dedicated facilities or security managers and what they need is simplicity and cost efficiency.